HYDERABAD, India (AP) India won the one-off test against Bangladesh in Hyderabad by 208 runs on Monday. The visitors were bowled out for 250 runs in 100.3 overs in the second innings shortly before tea on day five. With this victory, India has won their last six test series stretching back to the tour of Sri Lanka in 2015. The No.1 ranked side is also unbeaten in 19 consecutive tests since then. Mahmudullah top scored with 64 runs, while Ravichandran Ashwin (4-73) and Ravindra Jadeja (4-78) shared eight wickets between them. Starting from overnight 103-3, Bangladesh got off to a poor start. Shakib Al Hasan (22) was caught at short leg off Jadeja in the third over of the morning. First-innings’ centurion Mushfiqur Rahim (23) then added 56 runs with Mahmudullah for the fifth wicket. Mahmudullah then reached his 13th test half-century off 84 balls, including six fours. Things were looking settled for Bangladesh when Rahim played a drive off Ashwin in the 53rd over, only for the ball to loop up in the air and he was caught at mid-off. Mahmudullah and Sabbir Rahman (22) then played out the rest of the session, taking Bangladesh past 200. After lunch, Bangladesh seemed to playing for time and the batsmen weren’t concerned with scoring runs. Only 42 runs came in this final session of the match as the visitors crashed to defeat. ”It was quite tough in the second innings. India have a lot of options in bowling, spinners and fast bowlers both. I am really proud of my team. We batted more than 100 overs in each innings. Hopefully we can capitalize on that. I think our fielding let us down,” said skipper Mushfiqur Rahim after the match. Mahmudullah and Rahman put on 51 for the sixth wicket. The latter was trapped lbw by Ishant Sharma (2-40), and his DRS review against the appeal was turned down. Mahmudullah, who survived a missed stumping and a dropped catch, was caught pulling at long leg off Sharma as well. Jadeja accounted for both Mehedi Hasan Miraz (23) and Taijul Islam (6) as India made short work of the tail. Ashwin trapped Taskin Ahmed (1) lbw to wrap up the win. Despite the loss, Virat Kohli complimented the opposition for putting up a fight especially after the hosts had declared their first innings at a mammoth 687-6d. 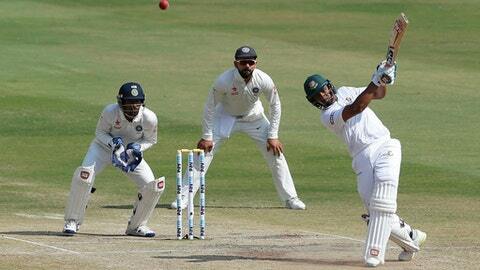 Bangladesh had replied with 388 in their first innings, and India’s 159-4d helped set an improbable target. ”It was a good wicket to bat on and I didn’t expect them to get out for 200-250 runs. They do have good batsmen in their ranks. They scored 580 in New Zealand recently, so they had some confidence coming into the series. They surely put up a fight in the first innings of the game. But our persistence as a bowling unit came out on top,” the Indian skipper said. India’s next assignment is a four-test series against Australia, starting in Pune on February 23.